We all wish that we were good enough at everything to teach the Girl Guide program in fun and creative ways for every activity, badge, and skill. But I know that while I am pretty good at most things and pretty great at some others, there are some activities best left to the experts. The nice thing is they are all around us! Many grocery stores have nutritionists who can give talks or grocery store tours, a choir director can come in for a session, dance groups love teaching children, and sports coaches or even teams may adopt a unit for a night to teach them something new. Our Guides are crazy about dance, singing, music and anything performing. We wanted to give them a night of dance but none of us felt qualified to give any real instruction or leadership. With this in mind, this fall I approached Tina, a dance teacher/fitness instructor at my local gym, about doing a workshop with our Guides and was elated when she agreed! We had a dance night in December where she taught the girls a warm-up, steps in various styles, and a short routine. She also led a discussion on healthy eating and incorporating movement and activity into your day, no matter what form it takes on. 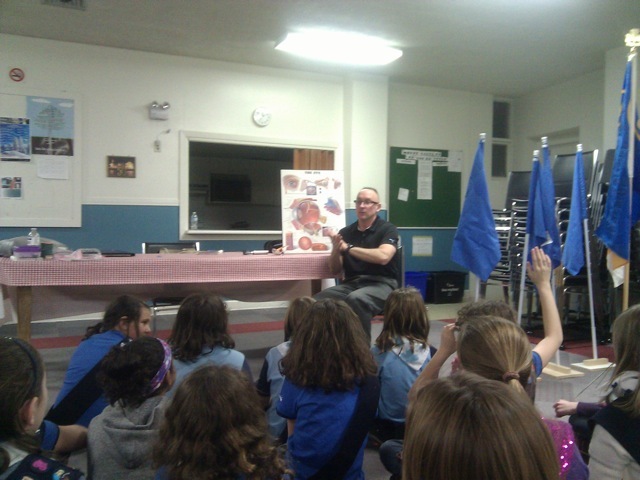 To complete the Body Works badge we asked a local optometrist Dr. Bill Clarke (and father of two of the girls in our unit) from the Ottawa Optometric Clinic to explain all about our eyes. 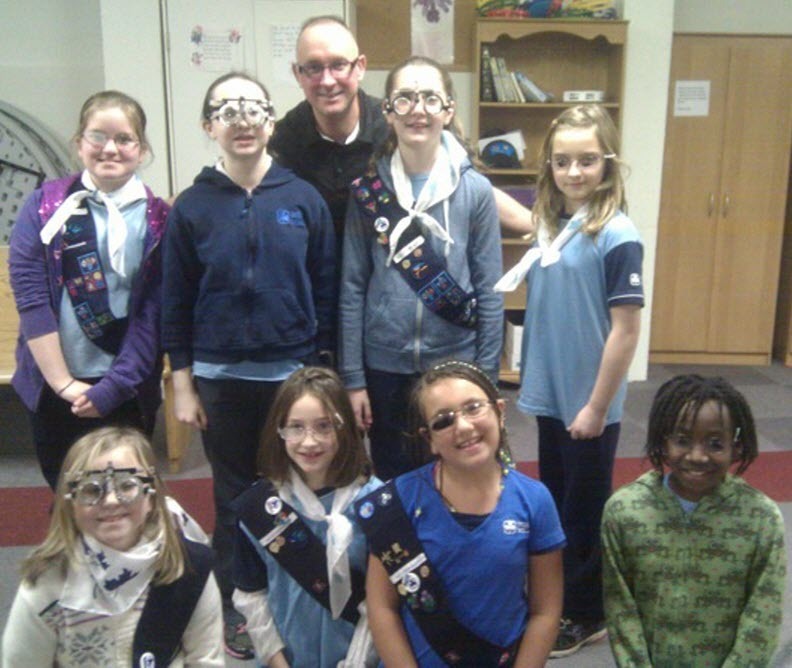 He has worked with other units in our area before from Sparks to Guides and gave a wonderful presentation about eye health, diseases of the eyes and how to correct them and the importance of regular checkups when the girls are growing and developing. What made the talk stand out was that he brought in glasses that mimicked different eye diseases and let the girls wear them and pass them around to “try on” what it feels like to need glasses and not have them. The girls really enjoyed the talk and benefitted from someone how has experience with talking to kids. He is even going to put our group photo in his office, which the girls are very excited about. Working with our “experts” was a fabulous experience and I learned a few tips along the way that will help make any expert-night a seamless experience. Ask well in advance and be flexible with meeting times. The experts have their own schedules to work around as well. Ensure you have the right space. We needed to swap spaces to get a gym to dance in. You may need to find a location with a kitchen or an outdoor space etc. Give the expert a copy of the relevant program work. It will help them to tailor their programming for the age and requirements. The expert may not cover all your program requirements, but if the girls have fun, consider it a success! Join in! This is a great chance to be hands-on and learn something yourself. Maybe even enough to lead the group’s activity in subsequent years if your expert isn’t available. Say thanks. Send a thank you note, either from Guiders or the whole group, to say thank you for their time and expertise. After our wonderful dance experience we are actively looking for ways to incorporate other Experts into our programming to give the Guides experiences we never would have been able to ourselves. 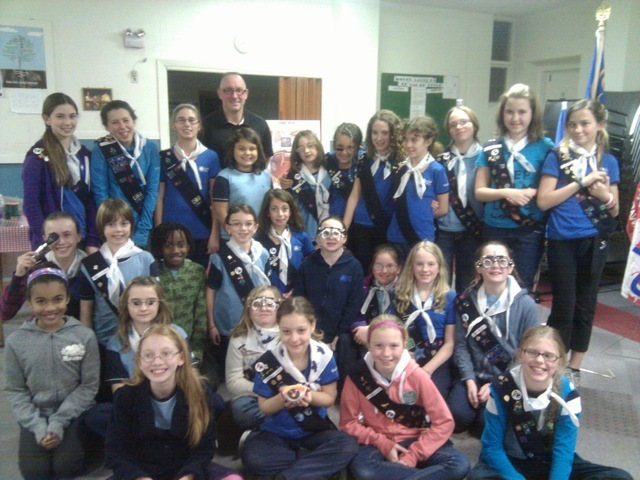 By guest blogger and Guider Michelle Parsons, 154th Ottawa Guides. Michelle is a PhD student at the University of Ottawa in Biochemistry. She likes to exercise and bike in the summer, and is learning to cook (slowly). Michelle tries to put as much STEM into her programming as possible. She also enjoys getting crafty and is occasionally known to join in a game of tag or wink murderer with the girls. This entry was posted in Awesome Activities and tagged inclusivity, STEM. Bookmark the permalink. Here’s a great way to thank your experts, besides girl created thank you cards, give the guest a box of Girl Guide Cookies. There’s also the Friend of Guiding pin (available at the Girl Guide Store) which makes a great thank-you, even nicer if you dress it up in a little box. Experts are such a good idea! It benefits everyone, the Guiders get a break from planning, the Girls become visible in the community (particularly if you meet off-site or send the pictures to your local paper), and the Experts are usually excited for the opportunity to share some knowledge with the girls. I think it’s great to look for women instead of men whenever it’s possible or you have a choice. GGC is an all-female organization and it’s nice to give the girls female role models with careers they can aspire to. We also had an expert, a local doctor (and father of one of our Guides) came in and help the girls put together a first aid kit and work on the First Aid badge with them last year They all enjoyed it. Also my husband, who is a cabinet maker came in this year to teach the girls about hammers, different types of screws, power drills and how to do some basic home repairs. The girls had so much fun learning and trying out their skills. To our Brownie meetings, we’ve had..
For goodness sakes, the options are endless! I like to keep a nice balance between guests and Guider-led meetings though. Guider-led meetings tend to involve leaders more, thus the girls develop relationships with the adults, instead of the leaders just standing back all the time. … Another fun one just popped into my head for Brownies: Invite “Sparkles” or “Molly Maid” to come teach about cleaning for the Key to I Can.. they’ve got all the supplies in their trunk! What a wonderful reminder of how to create a simple and memorable meeting with a long lasting impact! Thank you so much Michelle! A wonderful reminder of how to create a simple and memorable meeting with a long lasting impact! Don’t miss this one!